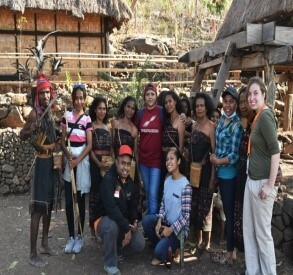 Alor is a large island in the Indonesian province of East Nusa Tenggara and it is about 55 kilometres Northwest of Dili, the capital of Timor Leste. The main town of this island is Kalabahi. The island covers about 2,330 square kilometres and it has many natural views that are very beautiful so there is a lot of tourism on the island. One popular tourist spots is Takpala, in North Central Alor Su-district. The word “takpala” derived from the word ”tak” means “barrier” and the word “pala” means “wood”. Therefore Takpala can be described as a “a wooden barrier”. 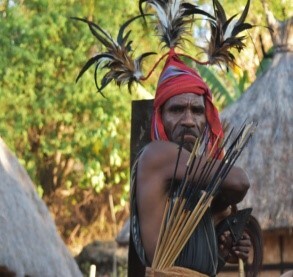 The Abuy (people who live in the mountains) people are the largest traditional ethic group on Alor. If you are going Alor, you should get to the island by airplane, the flight usually takes around 45 minutes from El Tari International Airport in Kupang, to Mali Airport. By ferry takes around 14 hours from Bolok harbour in Kupang to to Kalabahi harbour. From Kalabahi it is 11 km to Takpala so you can get there by car or motorcycle in about 30 minutes. After arriving in Takpala, you can see beautiful view of Alor and it offers a soothing atmosphere with fresh air because the location is in the highlands. When you enter the place, local residents may ask you to sit down in the traditional chair of wood or bamboo. You might be asked if you want to see the traditional poetry by their headman and there are some rules like you should not laugh during the traditional poetry, you should be silent when listening. After that, the residents dance Lego-lego (ritual dancing) and lego-lego dancer wears traditional clothing, and the women’s hair is left loose. Typical Takpala dance is done in groups where everyone holds each other in a circle around “the mesbah” (place of ritual in the middle of village area which is made from large stones). Facing inward and holding each other around the waist, everyone marches round while singing along with the beat of the Moko drums. Dancers move as one in a rythm, and as the dance goes on, everyone moves faster and faster in the circle. You can follow them and join in with dancing lego-lego. Performing the same dance in a circle and taking photos and video with them is fine because they are very friendly. After that, you can go around to the place because there are many traditional things that you can find in there like many lopos or traditional house, mokos (small bronze drums). You can pay Rp. 50.000 to wear the traditional clothes. For woman, you can wear Keng (sarong), Pakai/ Fulak (small basket for sirih pinang), awering (like crown from koli leaf), fok (belt), and lasing (the brass ankle rings), bracelet, muti (necklace). And for man, you can wear nowang (blanket), kiti-kiti (crown), sora (weapon) and koling (weapon), pet kafuk (archer’s bow), baisa (belt), kamol (small basket for sirih pinang). Before leaving, don’t forget to buy souvenirs from the collection of traditional objects and handicrafts Takpala population. They also sell handicrafts such as woven cloth, necklaces, and bracelets.